We are still a long ways off from Warp Drive, Transporters and Matter Replicators. But a Star Trek inspired Tricorder device may be coming to a medical facility in the near future. Announced at CES 2012, the Qualcomm Tricorder XPRIZE is a $10 million global competition to stimulate innovation and integration of precision diagnostic technologies, making reliable health diagnoses available directly to “health consumers” in their homes. 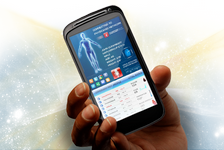 Qualcomm has a vision for medical care that will transform science fiction into everyday practicality. The dire need for improvements in health and healthcare in the U.S. has captured the attention of government, industry, and private citizens for years. But a viable solution has yet evaded one of the most technologically advanced, educated and prosperous nations on the globe. Integrated diagnostic technology, once available on a consumer mobile device that is easy to use, will allow individuals to incorporate health knowledge and decision-making into their daily lives. Advances in fields such as artificial intelligence, wireless sensing, imaging diagnostics, lab-on-a-chip, and molecular biology will enable better choices in when, where, and how individuals receive care, thus making healthcare more convenient, affordable, and accessible. The winner will be the team whose technology most accurately diagnoses a set of diseases independent of a healthcare professional or facility, and that provides the best consumer user experience with their device. As envisioned for this competition, the device will be a tool capable of capturing key health metrics and diagnosing a set of 15 diseases. Metrics for health could include such elements as blood pressure, respiratory rate, and temperature. Ultimately, this tool will collect large volumes of data from ongoing measurement of health states through a combination of wireless sensors, imaging technologies, and portable, non-invasive laboratory replacements. Finalist teams will compete in both a diagnostic and consumer experience evaluation during the Final Round. The Final Round evaluation will occur in the United States, although the competition is open to teams from around the world. Teams will be expected to meet baseline standards of accuracy and functionality, but the winning entries will be the ones that score the highest in the diagnostic contest. To emphasize the importance of consumer use and adoption, only the five highest scoring teams from the consumer experience evaluation will be eligible to win. For a complete list of on-going XPrize contests related to health and medicine, visit the Life Sciences page .